You may have been wondering "Where has Jenny been?" and if you've been following the weather reports for the east coast you probably assumed that I've taken my place on the Arc along with all of the other species in pairs. I guess me and Aaron represent the CraftyCakeArtists species. Well, for us personally the rainfall was sort of a non issue. We're on a hill, have no basement, and Whole Foods is right around the corner if we need food. Our biggest fear in stormy weather is a power outage because when it rains we take that time to lock ourselves in and work nonstop which would be so impossible without lights. So that leads me to explain where I've been and the simple answer is : Catching Up. We were both under the weather last week and needed to pull a couple fourteen hour days to get back the lost time. On the side we're also working on some handpainted furniture for some local clients. Handpainted furniture used to be our main gig. We've done it since we were teens and amassed a big client base in our area, which lead to opening a store, which then lead to closing our store because we quickly figured out that being stuck in a retail shop seven days a week was not our cup of tea. So, every now and then we still take custom furniture jobs and they're a lot of fun when they are few. So now I'm back to blogging and I really hope to post on a much more regular basis. I've been thinking a lot about collections, collecting, and collectors. (And I know that I'm preaching to the choir on this one.) I think about the ways that collecting bonds us all together. The way our collections represent gateways to our souls. Collections are almost always Honest. They can indicate who we really are. It's rare that one would covet and gather something just for the heck of it, or because 'somebody else is doing it so it must be good'. I don't think we follow the herd when we collect. I think it's our truest little spot of individuality and a good hearted and very necessary bit of selfishness. We want this stuff for ourselves because welike it...and we don't have to say any more than that. And if we take it to the obsession level it ain't so bad...unless we start breaking the bank, but that's a different story. For my whole life I've been a collector and have been magnetically drawn to other collectors. All of my friends, close and distant, have collections. A lot of us are into the same stuff and that's a thrill but it's even cooler when you meet someone whose got a totally different thing going on. Like my friend Tricia, she loves to travel, likes anything airline-esque, airline food, luggage labels, fake airline food and even just fake food in general. She's a vegetarian but loves her fake fried chicken! When I hang out with someone new, like a friend of a friend, I like to find out right away what they collect. It will always be a great indicator of who they really are. Sometimes you can size someone up like: " I bet he's got at least three pieces of Herman Miller furniture, an Eames chair, and a bookcase full of Frank Lloyd Wright style books." Or someone can totally throw you for a loop. Either way, I think you'll find that a person's collections act as little windows to their hearts. So here's a look through my window. 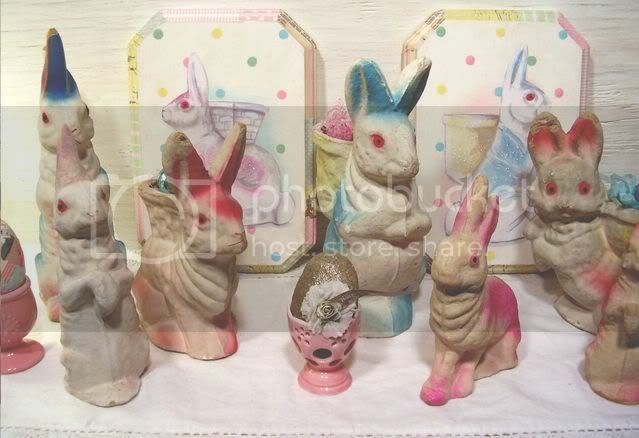 I've been wanting to put my Springtime collections photos up for a while and only now have I gotten the chance so please excuse me if you're all Eastered out ( I'm an Easter all year type!!) 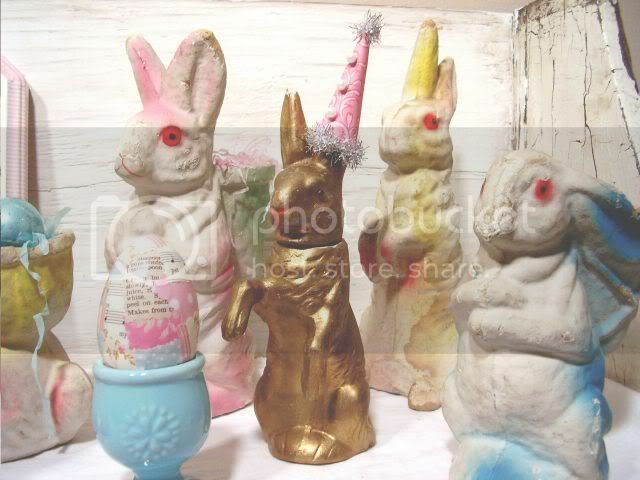 The paper mache rabbits are truly one of my favorite things. I can never have too many! 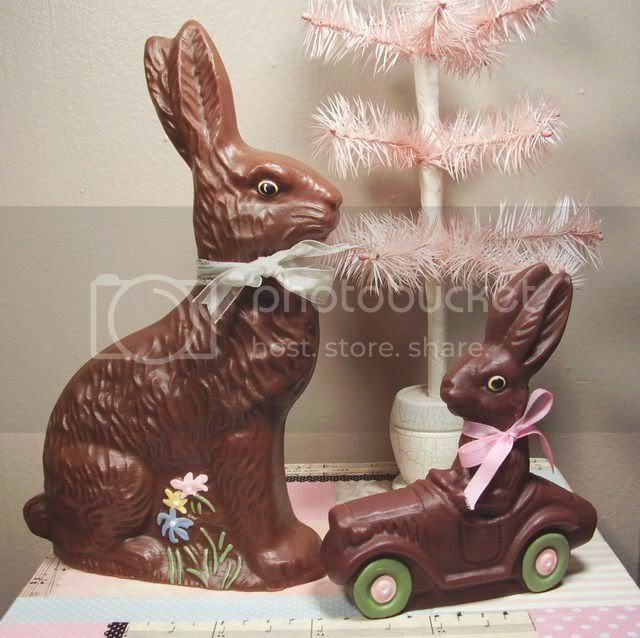 And fake chocolate rabbits are probably better than real because they last forever and are calorie free!! 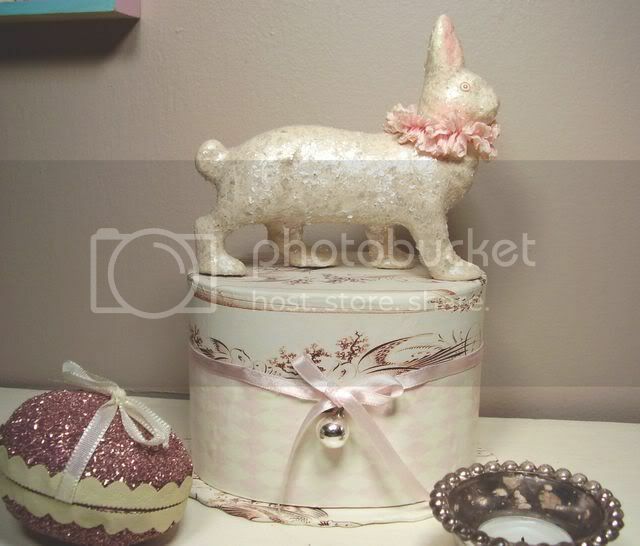 Also, Dee Foust and Nicol Sayre always generate some of the sweetest things I'll ever lay eyes on...check out the bunny box and the Springtime Greetings piece, love 'em to bits!! And my absolute Find of the Year!! 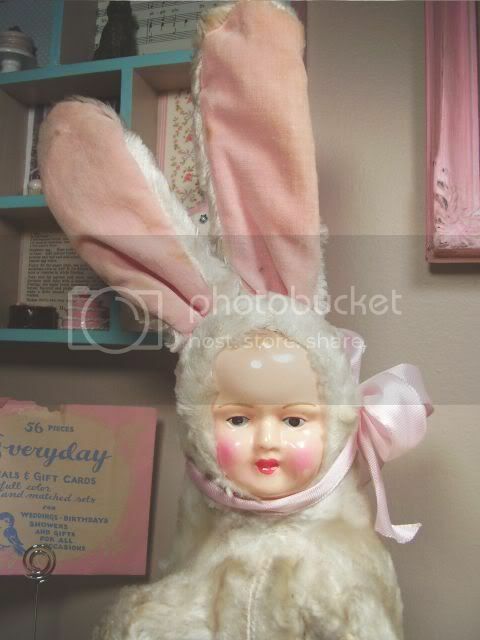 (last year) My vintage composition doll face/ stuffed bunny. He is something I would grab in a fire. An example of my value designation method: "If the house was burning down what objects would I save first?" That's how I rank my possessions. Does anyone else out there use the same value gauge? As a child I always thought about and feared fires and I don't know if my worry came before or after the time around first grade when I came home to our house on fire. It was the epitome of terror. No one was home, but to see my house surrounded by fire trucks and smoke billowing out of the front windows was like the end of the world. Luckily it was just the basement area and everything was repairable. From then on I had a pillowcase in my dresser that I always thought of filling with my favorite things before running out of the blaze. I liked the silver foil "Tot Finder" sticker affixed to my bedroom window and recently me, Aaron and Walt took a ride past my old house and that same sticker was still on the window...I haven't lived there in twenty something years! Well, I can't say I won't post Eastery pics in the near future but at least for the day I got 'em out of my system. Now for the cutie sitting atop the chocolate cupcake. That's Chloe, the adorable daughter of Kari / Artsy Mama (who is currently hosting a handmade May basket swap!! I'm so psyched to be a participant...my swap recipient hails from Germany!!). This was a little gift we made for Chloe's birthday, and Kari sent us one of her Springtime "prize ribbons" and a super sweet stuffed bunny! you must pop over to Kari's blog right away to see pics of the birthday girl's big day!! Do you get any cuter? Oh my!! What a doll!! And this here little chick plaque is my creation for the "Spring has sprung" swap hosted by Danielle of The Vintage Dragonfly. I can't wait to see all of the other swap photos posted on Flickr!! Ok, one last thing in the Easter category and although it's the last it is no where even close to the least! 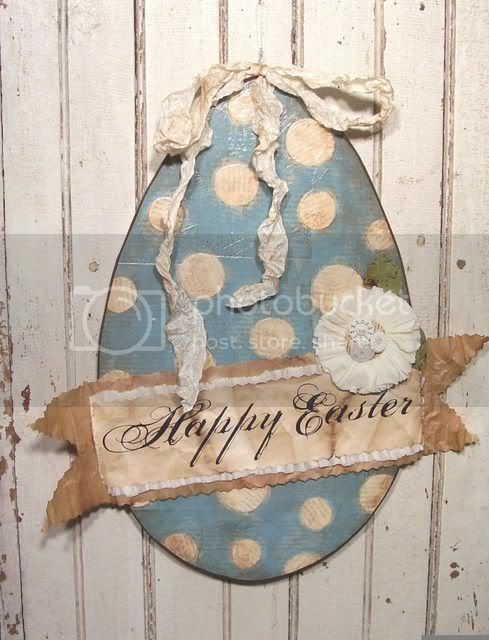 This Happy Easter egg is from the enormously talented Cari Kraft! She is one of the best designers ever!! All of her handiwork is meticulous and perfect in every way. Just the way it feels in your hands is like nothing else. It's so solid and layered with age and smooth varnish. It has the perfection of something machine made, and I mean that in the best way. For instance, look at your computer and all of it's tightness and perfection...you couldn't make it with your hands. Well that's how I feel about Cari's work...flawless. We are big big fans over here! This was her end of a one on one swap. Cari, your cake art is on it's way soon! You seriously rule Cari!!! Alicia Paulson of Posie Gets Cozy: She posts nearly everyday and never once does she not bring a bit of fun, levity, and unique perspective. Her, Auds (an amazing black and white corgi), her kitty "the B", and her husband Andy live in a colorful world of constant creativity. From the sewing machine to the cooktop, Alicia is in perpetual artist mode...also she's a born wordsmith and a three book deal waiting to happen! Amy Powers of Inspire Company: A sweet soul to the core with a fabulous shop ta boot! Her opinions and thoughts are always delivered in the kindest of ways. I love that she's alllll about family and friends and nothing comes ahead of that in her world. Jen O'Connor of Earth Angels Toys: If you read about something on Earth Angels Toys a few things are certain---it's new, it's fresh, it's unique (that word is over used but in this case it's essential), and it comes from a gal with the purest of intentions. Jen has "the eye" for all things you need to know about. Editor extraordinaire! 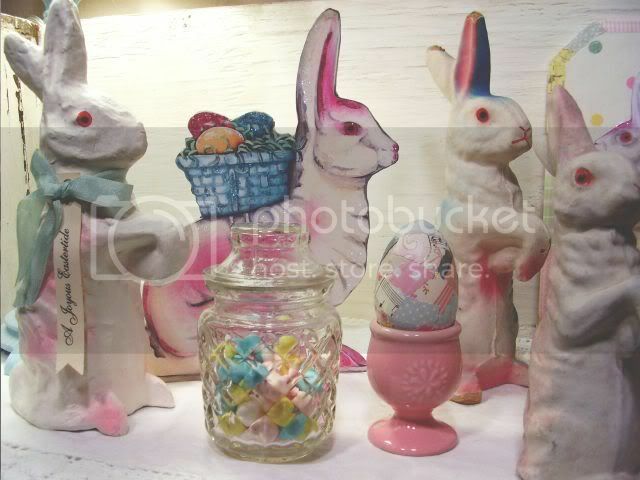 Jenny Adams Hernandez of Polka Dot Pixie: Jenny is an amazing talent! I own a few pieces of her work and they are things I'll treasure forever. Her blog is a total reflection of her infinite talent. There are some great vacation pics, day trip stories, family anecdotes, and she's a fellow Lost fan! And every so often she'll give you a glimpse of a new creation and that right there is enough to get me checking in daily. Emily of The Black Apple: Emily is one of those girls who probably sees colors the rest of us don't see. She's a painter, a stitchwitch, and a fabulous decorator. She's got a decidedly tiny story book world full of her endless flourishes of creativity. She is the embodiment of "cut from a different cloth" in the way she lives and the art she creates. And you know on those blah days when you feel like you have nothing to talk about? Well Emily always has something to say and she says it with straightforward wit and clarity. Also, her prints make wonderful gifts!! 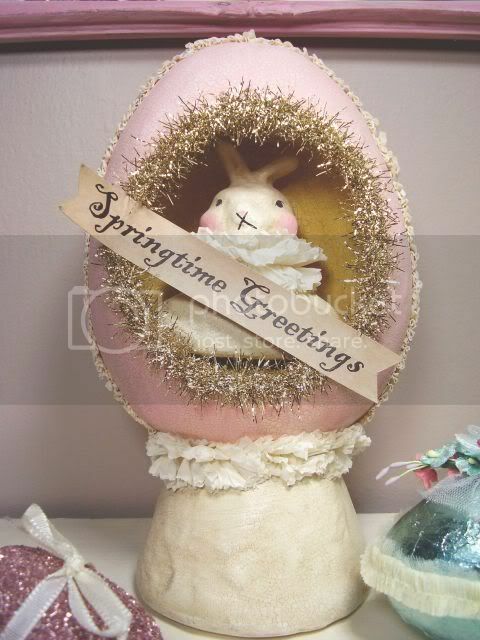 I love your littel chick... "Celebrate Spring"!!! So cute!! You are two busy and talented people! I love everything! Will you do other orders of little girls on cupcakes? I'd love to have one of each of my three girls!!! Such sweet words from a dear friend!!! I am so glad you like my art pieces and that you get the textures!!! I LOVE the textures!!!! I am all about touch and the depth of a piece. Really gives me goose bumps!!! You are going to need to move into a bigger place soon because your collections are amazing!!!! Love all of them and thanks for the links to new blogs!!!! Big smooches to you and Aaron!!!!! What a delightfully beautiful spring-time post! Ok, honestly I cannot tell you how glad I am you are back! I'm sorry you weren't feeling well. I'm not Eastered out yet. I wasn't really able to decorate that much b/c we are moving so I'm packing up stuff. I do have a painting furniture ? though. What is the best way to paint a oak kitchen table? I painted it white then used spary polyurethane and it's just all sticky. It's been about a year now and I wnat to start over. My husband always says, "Remember that nice oak table we had one time?" LOL! Hop over to my blog and let me know if you have any ideas for my swap! This post is GREAT. My bunnys are out all year round also!! They are just so sweet, I couldn't possibly put them is a box to store. 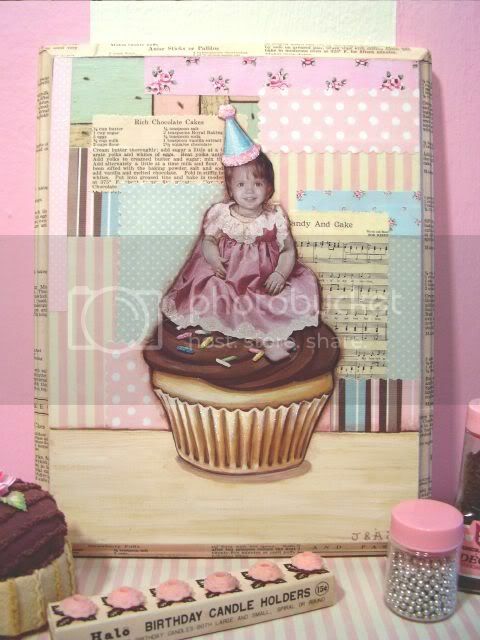 Chloe on a cupcake is Beautiful!! OK, Jenny, you REALLY need to make your Welcome Spring "tile" for eBay. I want to buy one! 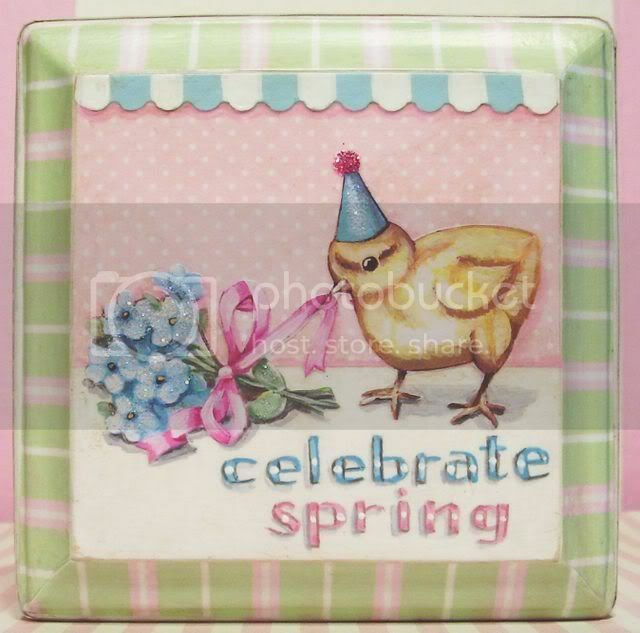 OK I mean your "Celebrate Spring" tile---Do you ahve any plans for making them for sale? Pretty please with lots of pink sugar on top! HI DARLING,SEND ME SOME INFO ON YOUR SWAPS.i HAVE BEEN SICK SO HAVE JUST FOUND IT.CHECK OUT MY BLOG AND COME TO MY FRONT PORCH PARTY,BRING YOURSELF AND ANYTHING ELSE/ONE YOU LIKE. For got to ask,I have you on my links waont to swap.I love your blog. I'm DYING for that egg! I was lucky enough to find one of those bunnies half off after Easter! I need to get a picture of my lonely little collection. You have such wonderful things!